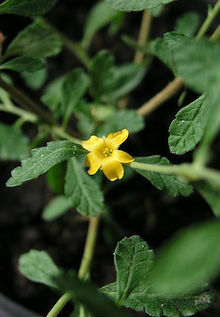 Damiana, or Turnera diffusa, is a flowering shrub found throughout Mexico, the West Indies, and parts of Central and South America. 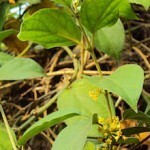 The leaves have historically been used as traditional herbal therapies for tonic and cleansing purposes. 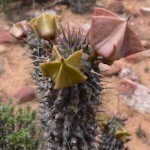 Indigenous people in Central and South America have used the leaves to make a tea, which is believed to have relaxing and aphrodisiac effects. Currently, the "Physicians' Desk Reference for Herbal Medicines," recognizes damiana leaf as an herbal supplement that may be helpful for boosting libido, relaxation, and weight loss. Damiana has a complex chemical makeup, its known compounds include ?-pinene, ?-carotene, ?-pinene, eucalyptol, tannins and thymol. The compound damianin, a chemical essential to the plant's structure, has been shown to produce a relaxing effect on the central nervous system. Damiana has also been shown to have a hypoglycemic effect, prompting discussion about its potential for diabetic and weight loss therapies. It is believed that damiana may function as an aromatase inhibitor. A 2008 study by the School of Pharmacy at the University of Mississippi investigated the anti-aromatase and estrogenic activity of damiana. Compounds isolated from the leaves were evaluated for aromatase activity using a tritiated-water release assay and for estrogenic activity using yeast estrogen screen assay. Damiana extract, and the extracted compounds pinocembrin and acacetin lessened aromatase activity. Other compounds, Apigenin 7-glucoside, Z-echinacin and pinocembrin showed estrogenic activity. Damiana encourages loose stools, which may help promote internal cleansing. However, damiana has gained the most attention when used with other plants to produce thermogenic activity. A 2001 Denmark study noted that, when combined with guarana and yerba mate, the combination produces thermogenic effects with appetite suppression. Over a span of 45 days, overweight participants were given YGD in capsule form before a main meal. The study concluded that the combination significantly delayed gastric emptying, reduced the time in which participants “felt full” and produced significant weight loss. 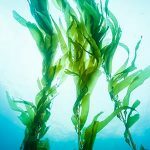 Furthermore, the mood enhancing effects, combined with the appetite suppressant effects, of damiana may lead to situational improvement of conditions that predicate to overeating, particularly persons who eat for emotional comfort. The efficacy of damiana for mood and thermogenic response has resulted in multiple patents being filed for oral appetite suppressant supplements that contain damiana. 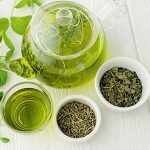 Damiana is widely available in health food and supplement stores in a variety of delivery methods that include tea blends, capsules, extracts, tablets, and tinctures. Damiana has shown to be most effective when used with other plants and herbs for sexual potency, weight loss, mood, and normal systemic function. Zhao J, Dasmahapatra AK, Khan SI, Khan IA. Anti-aromatase activity of the constituents from damiana (Turnera diffusa). J Ethnopharmacol. 2008 Dec 8;120(3):387-93. doi: 10.1016/j.jep.2008.09.016. Epub 2008 Sep 26. Andersen T, Fogh J. Weight loss and delayed gastric emptying following a South American herbal preparation in overweight patients. J Hum Nutr Diet. 2001 Jun;14(3):243-50. Kumar S, Madaan R, Sharma A. Estimation of Apigenin, an Anxiolytic Constituent, in Turnera aphrodisiaca. Indian J Pharm Sci. 2008 Nov;70(6):847-51. doi: 10.4103/0250-474X.49143. Kumar S, Sharma A. Anti-anxiety Activity Studies on Homoeopathic Formulations of Turnera aphrodisiaca Ward. Evid Based Complement Alternat Med. 2005 Mar;2(1):117-119.